Governor Jerry Brown’s revised budget proposal, released today, is a turning point in California’s fight against climate change — through a first-of-its-kind effort, the state would incentivize sustainable farming practices that draw down carbon dioxide from the atmosphere and store it in agricultural soils. The state is also looking to farmers and ranchers to limit other potent greenhouse gases like methane and nitrous oxide, as outlined in a number of climate change and agriculture initiatives in the May revise. The Governor’s proposed $20 million investment in the Healthy Soils Initiative is an important start toward realizing climate solutions in agriculture. State Senator Lois Wolk’s (D – Davis) Senate Bill 367 would fund a similar program with $50 million to incentivize enhancing soil carbon and reducing other GHGs on the state’s farms and ranches. As the legislature takes up the budget, CalCAN farmers and conservation allies will push for a robust program to meet the challenges of climate change for the state’s agricultural industry. Last month, Governor Brown issued an executive order emphasizing that farms and ranches should be managed to store carbon as part of his vision for reducing greenhouse gas emissions by 40% before 2030. Drought-stricken growers around the state see this as an opportunity to jump-start the use of climate-friendly practices that build healthier soils for water retention, erosion control, and multiple environmental benefits. $75 million for agricultural water conservation and efficiency measures, aimed at water savings and GHG reductions ($40 million for CA Dept. 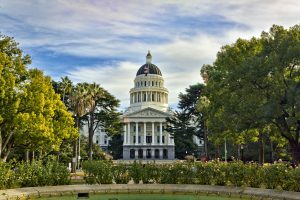 of Food and Agriculture in cap and trade funds; $30 million for Dept. of Water Resources in Proposition 1 funds). $25 million in cap and trade funds for agricultural energy and operational efficiency (CDFA). $7.5 million General Fund for drought assistance for unemployed farmworkers, including job training (Dept. of Community Services Development). The May revise also includes funding for the Sustainable Agricultural Lands Conservation (SALC) program, which is a part of the larger Affordable Housing and Sustainable Communities program. SALC aims to avoid GHG emissions associated with the conversion of farmland from sprawl development. The Governor proposes more than doubling total AHSC funding to $400 million.